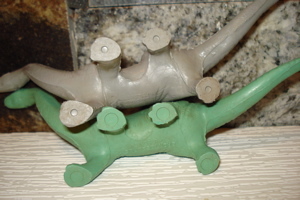 The Marx Brontosaurus helped kick-off the Dinosaur toys revolution. That was the year that MARX introduced its Brontosaurus to the world and started the Dino-ball rolling. 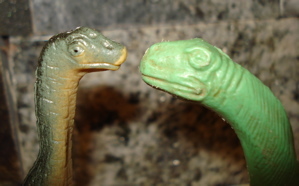 Prior to that time there simply were no real Dinosaur toys to be found. SRG had been producing their own metal museum souvenirs since 1947 but those were poorly detailed and fragile, really not toys at all. 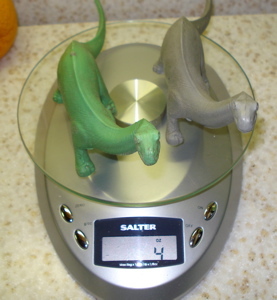 Then, in 1955 Marx weighed in (at a solid two ounces) with their first (1955) Brontosaurus. Four years later they came out with a "revised" (1959) edition. Both versions are virtually identical to each other. They both are very nicely detailed (considering that these are at ~1/100 scale) with pachyderm-like skin folds, as well as highly detailed heads and feet. These were virtually perfect. 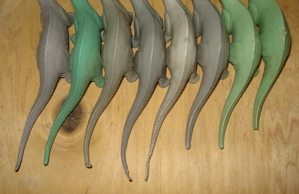 They were tough, rubber Dinosaur toys, with the ability to stand up to lots of rough play. If flaws they had then there were only three. The first is the head itself. Due to early mis-identification a Camarasaurus head had been placed upon certain Brontosaur museum skeletons> Marx continued this tradition in their Brontosaurus. An endearing mistake. It also makes for a more robust looking little fella. The above photo shows more what the real Bronto-head should have been like. As if it really mattered. These are toys. The second mistake has to do with the legs, which are a bit too short and stumpy (here compared to the 1984 Invicta Apatosaurus), and the feet themselves, which are more elephantine (round, with short toe nails) while the Apatosaurus (today's proper nomenclature) actually had longer feet with very large inner claws. As noted earlier the 1955 and 1959 versions are "virtually" the same. In fact, you really can't tell the difference in casual observance and a closer examination is called for. The first and only obvious difference is on the bottoms of the feet. The original has large "mold circles" on all four feet while the revised model has small ones. That's it. The second difference is slightly more subtle. 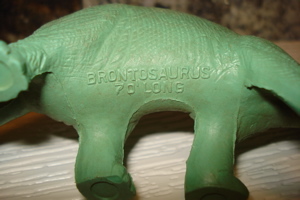 The original Large Mold Bronto has his name and length clearly embossed on his belly for all to read. 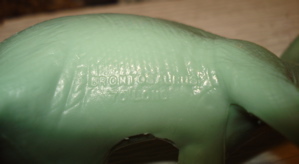 up on his right belly (they can be seen from the side) but the embossing is much shallower and less distinct. More of a muddled expression of self-pride. The Marx Brontosaurus likes to get out and about and usually does so in large groups. This provides both a "family-outing" atmosphere and mutual protection from predators. A herd of Brontosaurus is nothing to mess with. Their mere numbers intimidate while powerful 'tail-sweeps' can severely injure potential predators. 'ganging-up' on, and intimidation of the smaller groups. And so the question arises- how do Marx Brontosaurs get damaged in the first place? Keeping in mind that there isn't a one of these less than about thirty years old and many are in their late forties and fifties. Given that, it is quite possible to find truly pristine examples of the Brontosaurus, either from collectors, ex-children or at flea markets where they can range from $15.00 to as much as $35.00. They are collectibles. The two main ways that these get 'injured' is, first (and most often), due to casual-predator attacks. Human children tend to like to chew on the tails. Over fifty years of existence that can be a lot of little teeth to avoid and not every Brontosaurus manages to. Other casual attackers can be dogs, cats and various creatures that dogs and cats are meant to keep out of the Brontosaurs' home. The second most normal form of injury is simple breakage. The tip of the tail is most vulnerable but breakage can occur almost anywhere down the trunk of the tail. Just remember the age of these figures and all that they have survived, even if just kept in a box in the attic or a closet. That any have survived intact becomes a matter of some significance. Marx Dinosaur toys really meet all of my criteria for great toys. Simple. Nicely detailed. Totally reliant on imagination. Today manufacturers are producing very highly detailed figures with great coloration and all of the same qualities. 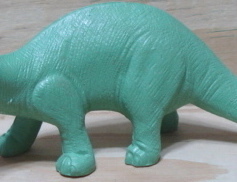 The Marx Brontosaurus has left the toy-box and become a treasured collectible, and deservedly so. So whether you want to learn more about other Apatosaurus (Brontosaurus) Dinosaur toys, increase your knowledge about the Louis marx Toy Company, or see all the Dinosaur toys it created.... 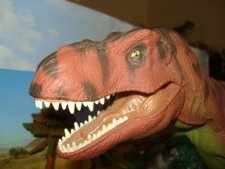 The Dinosaur Toys Collectors Guide is really your Dino-Central for all things Dinosaur and Dinosaur toys in the twenty-first century.